Usain Bolt has received his 100m Gold medal nearly a whole day after winning the race in Olympic record-breaking time. Twitter said Usain's Bolt 100m final win last night saw a new Olympics peak of 74,000 tweets per minute. New peak in #Olympics conversation: 74k TPM about @usainbolt winning the 100m yesterday. And a day after becoming the 100m Olympic record, Bolt also passed the one million follower mark. I congratulate the Government and people of Jamaica on the 50th Anniversary of their Independence. This is a significant milestone for Jamaica, for the Caribbean and for the Commonwealth. During the Olympic Games, Jamaica House has been providing a home from home for Jamaican athletes and fans, and providing people in the UK with an insight into Jamaican life and culture. This demonstrates yet again the extremely strong relationship that exists between our countries, and the shared history, culture and values that bind us together. I encourage people to visit Jamaica House to celebrate these links and to join in the Jamaican celebrations. Jamaicans Usain Bolt and Yohan Blake claimed gold and silver medals in the 100m final last night. The judo bronze medalist hit a man after he threw a bottle on to the track at the start of the men's 100m final last night. Edith Bosch was standing close by when a green plastic drink bottle was thrown from the stands behind the start line. Her involvement was brought to public attention on Twitter, where she wrote: "A drunken spectator threw a bottle onto the track! I HAVE BEATEN HIM... unbelievable." She later told Dutch television station NOS TV: "I had seen the man walking around earlier and said to people around me that he was a peculiar bloke. A man was arrested inside the Olympic Stadium last night after throwing a plastic bottle on to the track just before the men's 100m final. The incident had no impact on the competitors or the event. Locog does not tolerate abusive or anti-social behaviour and will seek to remove people behaving in this way from its venues. An audience of 20 million people watched Usain Bolt win gold in the men's 100m final, according to BBC figures. Olympic champion Usain Bolt told reporters what he had eaten to prepare for the 100 metres final. For breakfast today (Sunday) I had some plantains, hash browns, some fruit, a wrap from McDonald's with chicken in it - and vegetables so it was healthy, don't judge me. A man has been arrested after a bottle was thrown onto the track at the start of the men's 100m final at the Olympic Stadium tonight, the Metropolitan Police said. 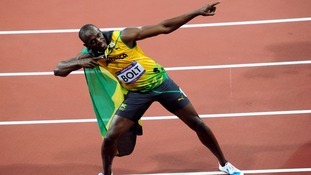 Jamaican Usain Bolt set a new Olympic record by defending his 100m title in London in 9.63 seconds.